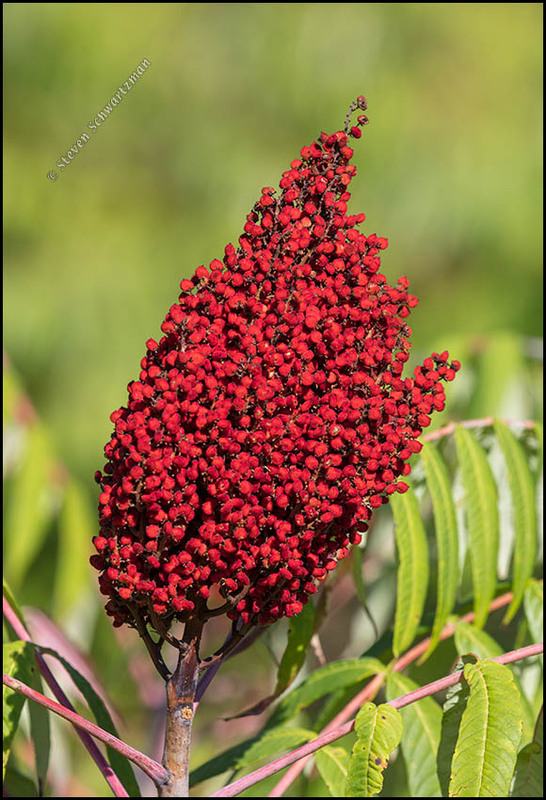 In my neighborhood on September 26th, the first time out taking pictures since returning from Alberta twelve days earlier, I found luscious fruits on some prairie flameleaf sumac trees (Rhus lanceolata). A few of the leaflets on this one were also turning red rather early in the season. I’ve posted plenty of pictures showing the bright autumn leaves of prairie flameleaf sumac, Rhus lanceolata. On August 11th I was driving up Alum Creek Rd. 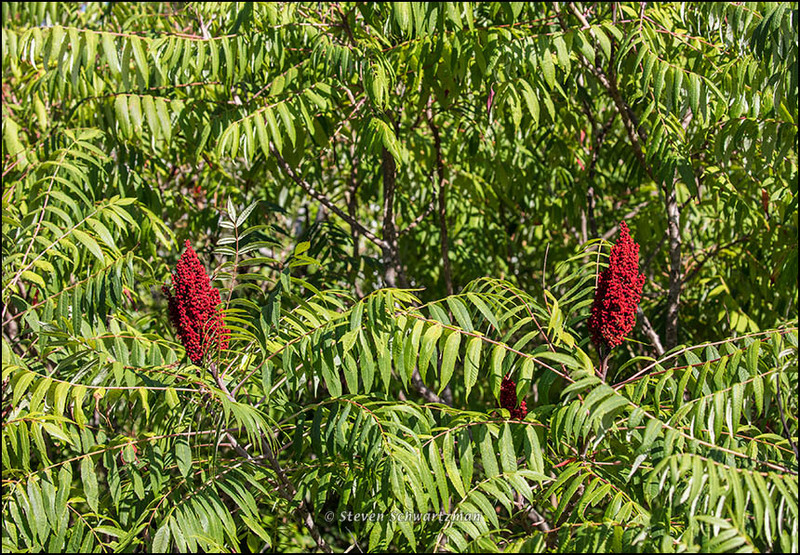 east of Bastrop when a group of sumacs caught my eye with the sunlight-saturated rich red of their freshly forming fruit clusters against the greenery of the trees’ foliage. I’m not sure which species or Rhus this was, as there are several similar-looking candidates in Bastrop County. I’d gone out that morning to get acquainted with a new 100–400mm lens, so I used only it on the entire outing. 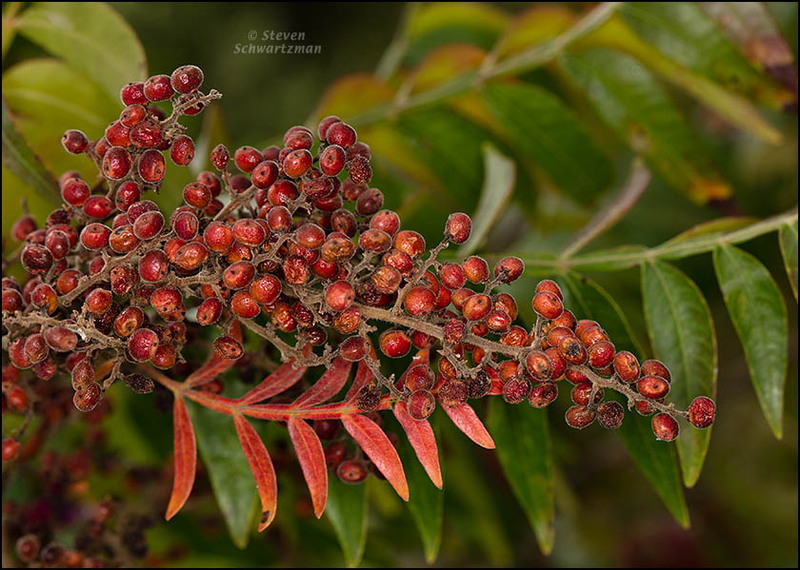 The fruit clusters high up in the sumac trees proved worthy subjects to zoom in on, as you see below. The autumn of 2016 in Austin has proven a dull one for foliage: we haven’t even reached the typical low level of color we expect in this warm climate. 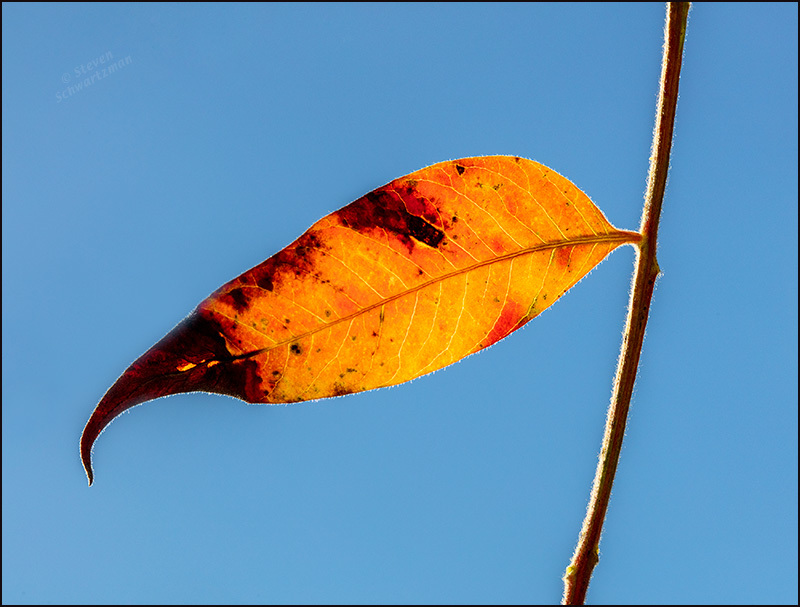 On November 24th I went over to a piece of undeveloped land off Seton Center Drive where in recent years I’ve relied on some prairie flameleaf sumacs (Rhus lanceolata) for good fall foliage. While I didn’t find the trees as bright as usual, I did discover a few small areas of color. Of more interest this time were the clusters of tiny sumac fruits. 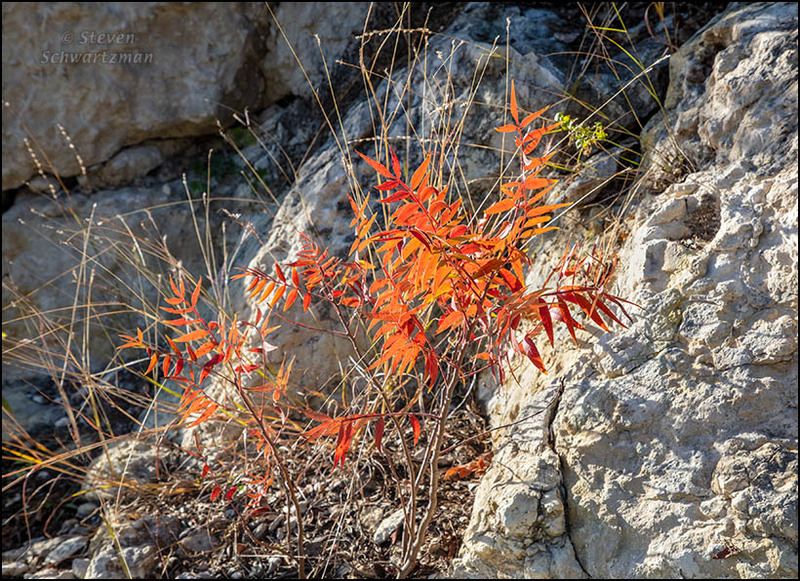 Several times during the Trans-Pecos visit I noticed Rhus trilobata, known as skunkbush and three-leaf sumac, which also grows in Austin. 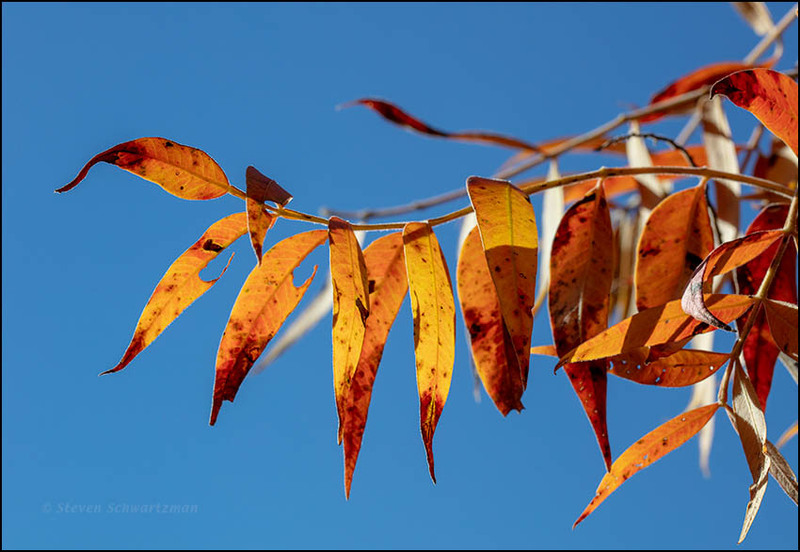 Like other Rhus species, three-leaf sumac has compound leaves that tend to turn colors in the fall. That’s what you see happening to this sapling in the shelter of some sotols, Dasylirion spp., in the Chisos Basin at Big Bend National Park on November 23. 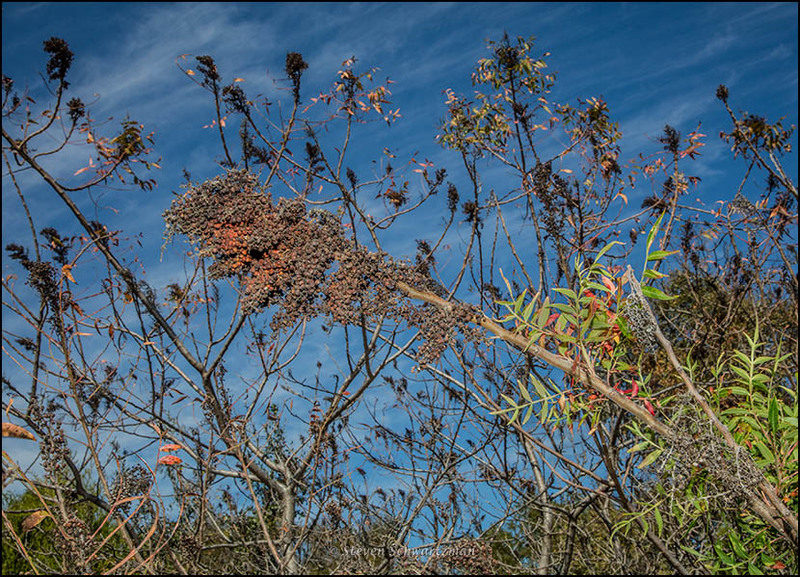 A lot is going on in this little scene aside from the emergence of the prominent red in the sumac. 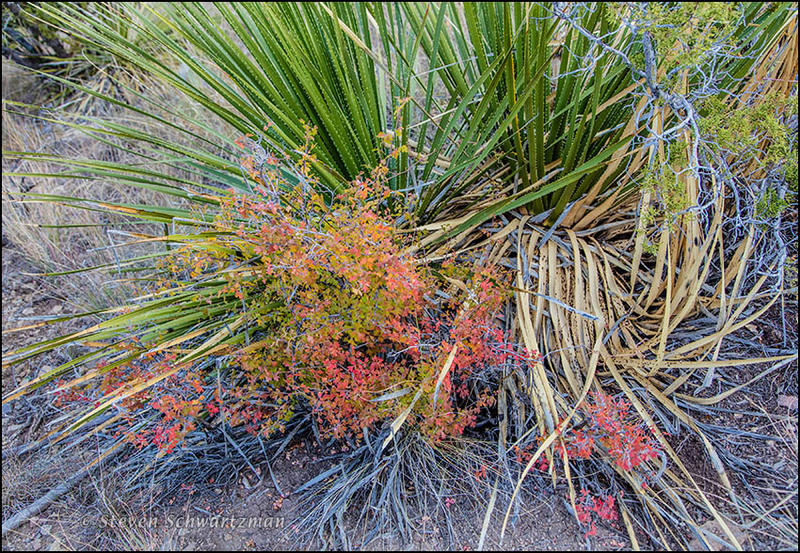 Notice how the sotol’s fresh leaves contrast in color and linearity with its tan ones. Less conspicuously, note that what was once a sotol flower stalk now lies fallen and gray on the ground in the lower left corner of the photograph. And then there are those scraggly dead branches of some other plant reaching in from the opposite corner.